Morel mushrooms are one of the delicious mushrooms that you can ever put your taste buds on. It can serve as an appetizer, side dish or even a main dish in itself and a perfect match with bread. 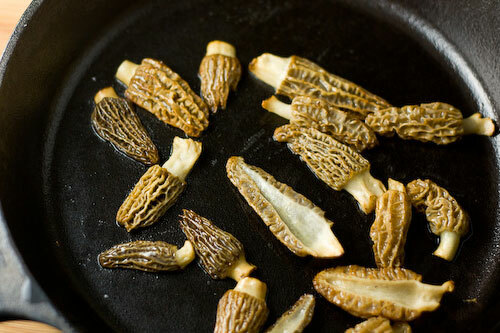 Before you even attempt on cooking morel mushrooms first, you must practice clean hygiene and ensure that the mushrooms are well-cleaned before you put them into the pan. It is because this type of mushrooms might have some living creatures like little critters on them. You do not want these to be included when you eat morel mushroom right? This is where you must be very careful. Look carefully and search for those little critters and clean each mushroom properly. When you are done cleaning the mushroom, it is now time to cook them with the use of an iron skillet. Wash the morel mushroom properly with water. Cut them into four pieces (vertically). In order to kill or remove those little critters found on the mushrooms, soak them inside a bowl that is filled with saltwater. Let is soak for couple of hours by placing it inside the fridge. If you do not attempt to cook the morels within 2 days right after you have picked them, all you need to do is get rid of the excess water. Then, cover the mushrooms with paper towel and place them inside the fridge. This technique will help your morel mushrooms to remain crisp and not being mushy. On a hot iron skillet, melt at least 3 or 4 tbsps. of margarine or butter. Make sure the butter does not get burn. Coat the morels in flour. You can do this step in two ways. First, use a plate with flour on it and roll the morel mushroom until each piece is fully coated. Second is with the use of a zip lock. You place flour inside the zip lock and place the morels right inside and shake it until such time the mushrooms are fully covered with flour. Next step will be to sauté the morels right on the melted margarine or butter. Then, add a crack of fresh black pepper and salt to taste. Serve. Enjoy eating morel mushrooms. Bon appetite!